It must be hard to make a ‘life story’ film for someone who dies so very young. While Valens crammed much into his 17 years as the film opens he is already nearing his rise to short lived stardom. In fact most of the film shows his family’s move from a fruit picking camp to urban Los Angeles, where in his pre-fame era, Valens lives with his mother, his unpredictable and potentially alcoholic and drug using half brother Bob, and Bob’s tormented girlfriend Rosie (Elizabeth Pena). The rise to fame is rapid and really glossed over here. It doesn’t take long for Valens to be discovered, not long again before he is recording, then on the radio, then on the TV, then touring with superstars of the era including the Big Bopper and Buddy Holly, both of whom accompanied him on the doomed flight that ended all of their lives, with Valens passing at the age of 17. Ritchie Valens (Lou Diamond Phillips) was a gifted young man arriving in the early years of rock n roll with a beaming smile, boundless energy and catchy tunes. 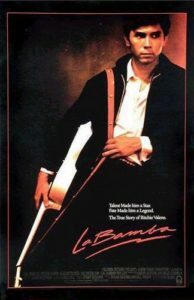 La Bamba tells his story, the story of a charismatic and potentially remarkable young singer who tragically does not have the opportunity to do anything truly remarkable. Final Rating – 7 / 10. La Bamba clearly shows the light of a precocious young man but cannot overcome the limitations of making a novel from an all too short story.